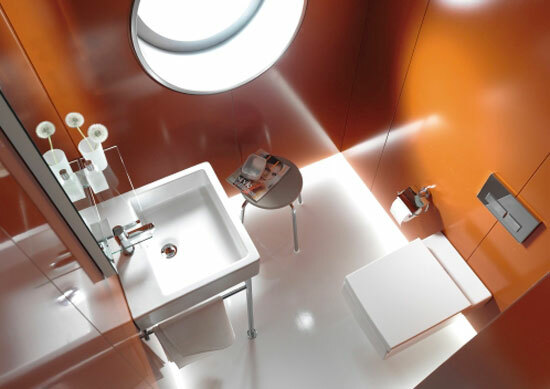 Create bathrooms that are small in space but still meet high expectations for hygiene, efficiency, comfort and style. Discuss ways to use space-saving and multi-functional combination units to provide highly efficient showers, toilets, bidets, storage and lighting in limited space. Specify bathroom furniture and equipment that is sustainable and water-efficient without sacrificing performance. Describe how small, well-designed bathrooms can meet the growing demand for universal design in large segments of the population. When reading about bathroom design, it’s not uncommon to see words like “bliss” and “sanctuary,” even “glamour.” This may seem like a lot to ask from a room whose main purpose is basic personal hygiene. But people have come to expect a lot from their bathrooms, not just efficient functionality and healthy hygiene, but comfort, stress relief, style and the positive emotion of being in a beautiful, personal space. At the same time, today’s bathrooms of every size must be sustainable, using efficient equipment and responsibly manufactured products and materials, and conserving water in the room of the house that on average uses more water than any other. Many bathrooms must also be accessible, not just in public spaces, and not just in places where physically challenged people live, but in the increasing number of households desiring thoughtful universal design for a variety of reasons. For example, by 2030 it is estimated that over 50 million U.S. citizens—one out of five—will be 65 or older. Those are a lot of issues operating in a very small room. Creating a space that can achieve those goals and also meet the taste of an individual personality is not easy even when space is abundant and resources are infinite. The challenge is greater when the space is limited. This course will focus on great bathrooms in small spaces. Large, opulent bathrooms will always be built, and many bathrooms today are more luxurious than ever before, as product technology advances and style possibilities multiply. In fact, ideas from spectacular bathroom examples can often be useful for designing smaller bathrooms. But for many reasons in today’s society, small bathrooms will be far more numerous than large ones. Imagination and innovation are necessary to provide the same amenities, but size doesn’t have to limit choice. Small bathrooms certainly must meet the same basic requirements for health, hygiene and functionality. With thoughtful design, they can also provide the other important things people ask of their bathrooms, comfort, relaxation, and the pleasure of style and beauty. A wall-mounted washbasin and toilet maximize space while maintaining aesthetic integrity.